‘Welcome to Pine Point’ is an interactive documentary that focuses on the now demolished town of Pine Point in Northwest Territories in Canada. The town was a mining town that the Canadian government ordered to be shut down after the mine closed in 1987. The website interweaves photographs, illustrations, archival footage and interviews together to take a comprehensive look at nostalgia and examine the question: ‘ What if your hometown never grew old. Would it be so bad?’. The project was created by Vancouver based duo The Googles, a group that consists of Paul Shoebridge and Michael Simons. It was produced by the National Film Board of Canada. The project began after Mike Simmons (one of the co-creators) visited his childhood town of Pine Point. What Simmons and Shoebridge decided to create was ‘a piece about memory, and how memory is utilized, filtered and activated. It’s way more a story about memory than a profile piece on a town’ (NFB Blog, 2011). The project was inspired by a website that documented Pine Point, called ‘Pine Point Revisited’. It was curated by an ex-pat of Pine Point, Richard Cloutier (Shoebridge & Simons, 2011). I am a student of Media Arts and Production currently, but I am also a writer. This work interests me because of its unique mix of story telling, using both writing and media. I found ‘Welcome To Pine Point’ a work that I instantly connected with. What I liked most about it was its ability to create atmosphere. Despite never having been to Pine Point or having any personal connection to Pine Point I felt connected to this work and was instantly intrigued by it. The pastiche style of the work was pleasing to look at and I found myself reminiscing on my own memories of child hood. It’s in this way that ‘Welcome to Pine Point’ can engage with a wide audience, by the universal theme of nostalgia and memory. It is also particularly interesting from an Australian point of view because it made me question what will happen to the mining towns of Australia after the mining boom. It made me question how these towns will be remembered and what will be their legacy? Some aspects of the work I particularly enjoyed were the profiles on individual people from Pine Point. In the ‘Then’ and ‘Now’ section, ‘Welcome to Pine Point’ profiles four ex-Pine Pointers: the Beauty, the Brothers and the Bully. In a yearbook style they present photographs and interviews with these ex-Pine Pointers. Each person is given a symbol to represent them. By reducing the interviewees to stereotypes Shoebridge and Simons illustrate how often in memory we are remembered for one singular aspect of our personality or often just one certain act. It’s easier to remember people as stock characters and that’s often how we identify ourselves in highschool: as nerds, popular girls, rebels. These archetypes are present in most people’s memories and thus it adds to the universal nature of the work. However, the Simmons and Shoebridge are aware of the inaccuracies of memory, as is illustrated when the text reflects on a misremembered memory, casting a light on the historical inaccuracies of reflection: ‘Turns out the lobby is grey. It never was blue…’ (Shoebridge & Simons, 2011). Other aspects of the work I highly enjoyed were the haunting aspects that really highlighted the manufactured and fleeting nature of mining towns. I particularly liked the section that, with a split screen showed Pine Point then and now. It was almost chilling to see that where there was once a bustling town, was now only concrete. The visual style of ‘Welcome to Pin Point’ is nostalgic. Showbridge and Simons have used symbols that are commonly associated with the past to instill a sense of nostalgia. For example the layout is arranged in a style reminiscent of scrapbooking and they frame slide shows like they are a collection of polaroids. In their choices of visuals Shoebridge and Simons have tried to echo Pine Point. They use wood paneling and yellowing album pages as backgrounds. ‘Even the colours and textures seem unself-conscious – wood paneling, perms, velour, deep shag – all enclosed in yellowing photos with rounded corners.’ (Shoebridge & Simons, 2011) It’s this ‘unself-conscious’ aesthetic that is utilised in ‘Welcome to Pine Point’. Rather than slick 3D animation they use flash to animate simple hand drawn images. They whimsically superimpose cut-outs of photos on to video footage of Pine Point. The videos are often shown pixelated and glitched. There are no slickly designed pages or lines. The colours are soft muted yellows and browns with no stark contrasts. This soft unobtrusive use of visuals evokes the feeling of looking through an old photo album. Cleverly, Shoebridge & Simons have used a cut and paste style of text. This is an inventive way of making sure that the text is always visible against any background, while choosing a visual style that is very much in tune with the overall look of the multimedia project. The use of a black Sans Serif font on a white background is perfectly conducive for reading. As mentioned before, the central themes of ‘Welcome to Pine Point’ is memory and nostalgia. The tone of the writing is sentimental and reminiscent. There is a glorification of a certain past. But the work also has an eerie quality that is reminiscent of the film ‘The Virgin Suicides’. Many elements of the work: aural, visual and written, have a haunting quality. I think this dreamy, eerie quality is most directly invoked by the sound. The music comprises of an original soundtrack by the Besnard Lakes created especially for the project. The music is incredibly cinematic; it is slow and often goes into minor tones. The language used within ‘Welcome to Pine Point’ is highly emotive and subjective. It is almost a personal essay in style. This is highlighted by personal reflections and soft pensive music that emotes a feeling of days gone by. The language within the work is highly evocative and subjective. While the work is informative, the language is far from passive. It actively constructs a glorified image of Pine Point. ‘Welcome to Pine Point’ is a Canadian story, and in particular a North Canadian story. The National Film Board of Canada hopes, in funding projects such as ‘Welcome to Pine Point’, to create works which reflect Canada to Canadian audiences and the rest of the world. In this way it was important for ‘Welcome to Pine Point’ to represent the specifics of the rural Canadian experience. I believe the intended audience for this project was to those already familiar to multiplatform story telling. I wasn’t able to get specific information about how ‘Welcome to Pine Point’ was made. However, I could find out that most of the projects hosted by the National Film Board of Canada are written in Python within the Djano environment, PyAMF, Apache and MySQL. The application is hosted on an Ubunto Linux server and they use the Pyro video player developed by Turbulent Media. Being hosted by the National Film Board of Canada’s website is a good choice because it will most likely mean the project gets reliable hosting. Additionally, by having the project standing alongside projects of a similar nature, it is more likely to attract attention of those who already appreciate multiplatform story telling. There are only two ways to navigate through ‘Welcome to Pine Point’: the ‘Next’ and ‘Previous’ tabs, or the chapter indicator that allows you to peruse through the different chapters. 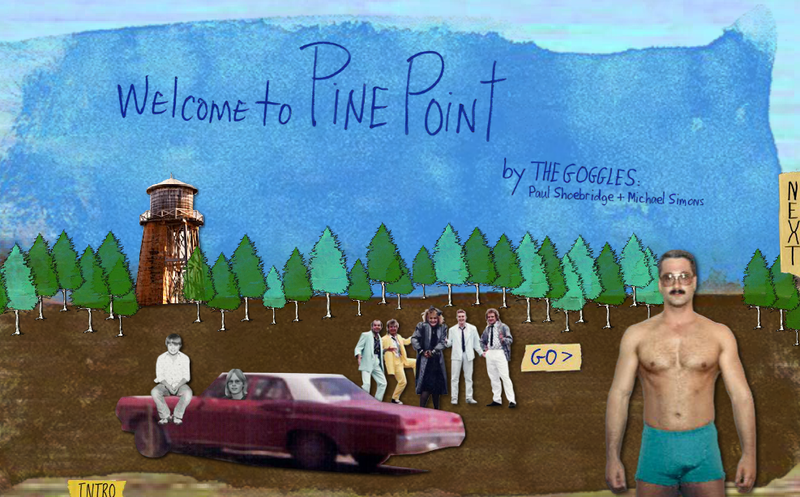 There are not many interactive elements in ‘Welcome to Pine Point’. You can click on certain images to look through pictures and click on sections to watch videos but for the most part it is limited. 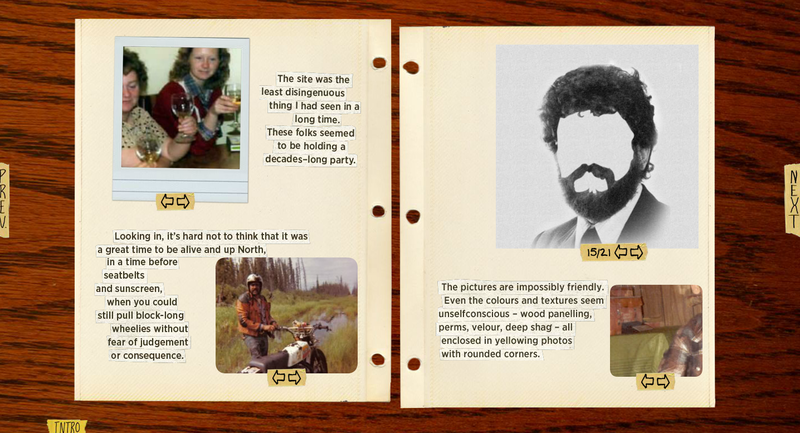 The most interactive section is contained within the ‘Odds and Ends’ chapter. On this page you drag away fabric badges to look at the text. It is my opinion that there are some missed opportunities in the lack of interactivity but understand if there were time or budgetary concerns. ‘Welcome to Pine Point’s low interactivity level had a clear justification for Simmons and Shoebridge: ‘Coming from print, part of the process for us was minimizing the interactivity to only those elements that serve to forward the narrative’ (NFB Blog, 2011). This entry was posted in Uncategorized by fliction. Bookmark the permalink.